Being very much a List kind of Lady, making the Non-Negotiable List makes me oh so very very happy. Katy from Pouting in Heels has come up with the great idea of making a list of things that reminds you what you are absolutely not willing to negotiate or compromise on, and I believe everyone needs them in their lives. You can read her list here. Thank you Laura from Life with the Baby Kicks for tagging me in your Non Negotiable List Post and introducing me to this fabulous idea. I can’t go a day without it, and you bet I have a secret stash of it in my bedroom. Chocolate makes me happy and yes, I am addicted to it. I have my favourites, such as Fererro Rocher and Dairy Milk Hazelnut, but almost any kind will do too. My supplies running out is simply not a problem I am willing to face in my life. I make sure the standard kiss goodnight and saying “I Love You” to both my boys before bed is not forgotten. I think in the fast paced lives that we lead, it is easy to sometimes forget to appreciate our loved ones, especially by simplistic verbal or physical affection. Therefore, I have made in an absolute ritual to make sure I remind both my husband and baby boy that I love them during the day, but especially before sleeping every night. This also ensures that between my husband and I, we do not go to sleep angry if we have had a disagreement, and it forces us to resolve all the issues before going to sleep. There is nothing that I will let come in the way of his happiness and making him my priority is absolutely non-negotiable. The fierce love that comes with motherhood means that I will always do everything in my power and do my absolute best to make sure Baby Z comes to no harm and is growing up to be the best person he can be. In sha Allah. Being a stay at home mum can often mean that you get too comfortable in a routine and you always manage to find something within the household that needs to be done, which in turn gives you very few reasons for you to venture out. Being a blogger has already motivated me to get out of the house to socialise with other adults, which I am very grateful for. However, for those days when nothing is planned, I still make sure that Baby Z and I get some fresh air and sun by taking a walk around our neighbourhood. I hope to make this a healthy habit by making it a non-negotiable in my life. I used to be such a book worm. My favourites of course were and still are the Harry Potter series, but apart from those, I am pretty sure I had read my way through the entire novel section of my local library back in England. Since getting married, moving to Dubai and having Baby Z, reading has not been given the importance I wish it had in my life. I want to make reading a non-negotiable and re-enter into the world of novels, adventures, horrors and fantasies, but also reconnect with reading blogs that I have not found time to read in the past few months. Feel free to let me know any book/blog recommendations that you feel would be a great start to get back in to the swing of things! Moving away from a land where I lived for more than a decade meant that I had made some life-long friends, and even though life sometimes gets in the way, I try to make it an absolute must to stay connected with those friends. Thanks to technology and apps on my phone like Whatsapp and Skype, this has definitely been made easy, but sometimes it all boils down to the effort you want to put in. I do want to carry on making the effort to stay in contact with my friends, and that is not something I wish to compromise on. There are probably quite a few more non-negotiable on my list, especially to do with religion and other personal aspects, but I think I shall end it here. So, I am passing the torch on to my fellow bloggers. I would love to see your non-negotiable lists! All you have to do is link back to Kate’s original non-negotiable list, mention me for nominating you, decide what in your life needs to be non-negotiable and then spread the positivity. I look forward to reading them! Lovely! Simple pleasures of life. 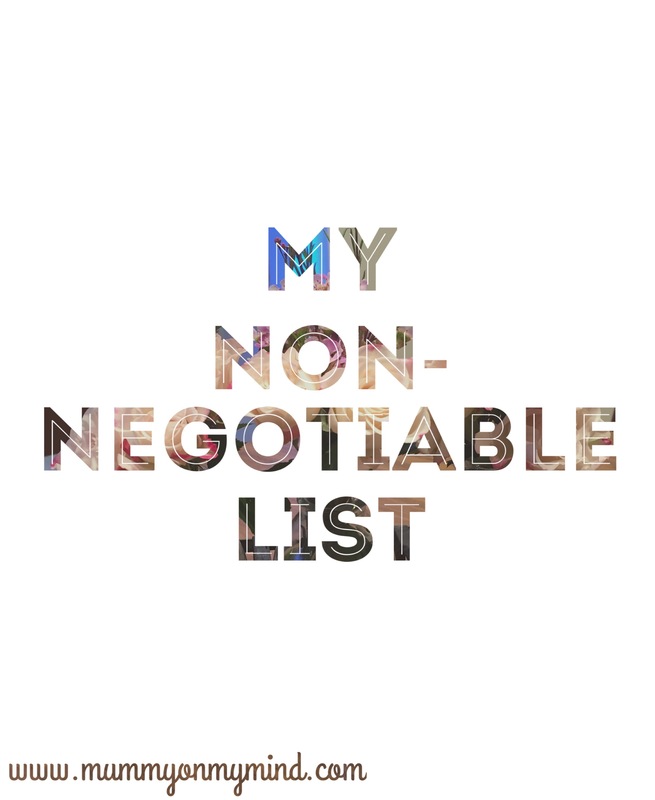 Would love to chalk out my own non-negotiable list! In the meantime, as a fellow blogger but a relatively new one in this field, I would love for you to check out my latest post and provide feedback. Thanks a bunch. Thank you! Glad you enjoyed the read! You’re very welcome, and I completely agree with you. Look forward to reading your list! ?